Welcome back, Bruthas and Sistas. Grab your overnight bags, cause we have a little ways to ride from where we left off last week in Wyoming to get to the Mid-Atlantic area. I had the opportunity to sit down with Jack Lord today, and he gave me a trio of tales from his time in the wrestling business. It was the summer of 1993, and the NWA was running strong at that time, and our first pair of tales comes from the shows that Paul Jones was booking in that area then. Jack was working as a heel, and did most of his riding between shows with Ronnie West. 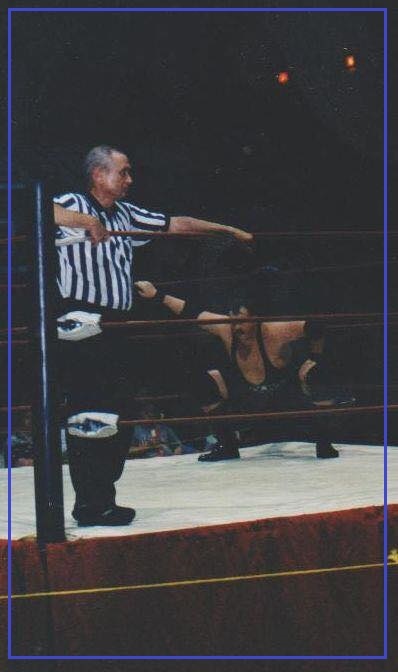 West is known for his time as General Manager at Continental Wrestling Federation, and also for his referee work throughout the south and southeast territories. The pair were embarked on a three day tour, with Ronnie at the wheel, Jack at shotgun, and fellow wrestlers Randy Rogers and Mike Mason in the back of the big Lincoln Towncar that Ronnie owned. They had left the first night’s show and after a few hours under their belts, Ronnie noticed that the duo in the back had fallen asleep. This is a cardinal sin for any road trip, and subjected said sleepy heads to be ribbed awake. Ronnie gave Jack the nod to look back at their would be targets. Jack turned around to see them snoozing away. West whispered his accomplice to scream at the top of his lungs when he got the signal. Before he had a chance to ask what the signal was going to be, West slammed on the brakes and locked up the wheels. Jack screamed bloody murder, like a little girl, and the two hit the deck in the back floorboard of the Lincoln. When they skidded to a stop, the two slowly emerged from the back with only the tops of their heads and eyes visible. Ronnie whipped around and asked the pair, “Ya’ll boys hungry??”. They never fell asleep the rest of the weekend. When you teach a lesson the right way, it’ll stick with ‘em. Later in the same tour of North Carolina, Jack and West had hit a patch of rainy weather that lasted a day or two. Ronnie had taken to driving by people really fast and splashing them with water as they walked down the sidewalk. Jack notices a lady pushing a shopping cart along the sidewalk. As she got closer instead of splashing her, Ronnie, stopped and rolled down Jack’s passenger side window. As his co-pilot looked over at him, he reclined his driver’s seat and said out the open window, “Hey hunny, how much for some of that booty?”. Jack made eye contact with the woman, who thought HE had asked her this. She began to throw canned goods and packages of food through the window at him as he feverishly tried to close it. Little did he realize that West had put the lock on the window and he wasn’t able to roll it up as the shower of foreign objects flew in the window at him. Ronnie West was definetly not one to get into a rib war with. Sadly, he left us a little over five years ago. R.I.P. road soldier. For our last story this week we have to roll the clock back to Halloween 1988. The location was the Alabama Championship Wrestling promotion, and Jack had been working there for a little while. One of the other boys that worked that area was named Big Chief and he stood nearly six feet seven inches tall. He truly lived up to his name. Unfortunately he also lived up to the reputation of being a problem to work with and was not a favorite or the boys that worked that promotion. After a bit of an absence from the area, the promoter informed Jack that Big Chief was going to be coming back in to work a show. He said that was fine, but he wanted to be in charge of the match. The promoter agreed and told him that the gimmick Big Chief was going to be working was a horror, Jason Vorhees, type of thing. The gears began to turn in Jack’s head and gave birth to a hilarious rib. Now Jack had a friend that did asbestos removal, so he gave his buddy a call and got one of the white hazmat suits that they wore to do their jobs. The next night he presented the suit, a hockey mask, and a wig to the mark before the show. The big man had some reservations about using the suit when he saw how thin the material was. Jack assured him that is was NASA rated and up to the task. He noticed that Big Chief was wearing red bikini briefs when he went to get his tights on. This only added fuel to the fire as Jack managed to convince him NOT to wear his tights, citing that he would get way too hot in the NASA gear under the hot lights above the ring. To Jack’s dismay, he bought the line of bull. It was supposed to be a squash match with a little guy that was known for taking high back drops and slams to get over with the crowd. Jack pulled him in on the rib, and told him that when the time came for the big backdrop to grab two handfuls of the suit in Big Chief’s backside and hold onto it as he went over. He agreed and they made their way to the ring when the time came. Just at the right time, the kid his his big flip spot on Big Chief, and got hands full of his suit. The thin material ripped right up the back and left the big man standing in the middle of the ring in his pretty, little red bikini undies. He ran out of the ring to the back where ole’ Jack was waiting by the curtain. Big Chief glared at him, and Jack asked him, “Do you have any questions?”. He did not. That was the last time that he was seen in that area during Lord’s run again. This is one of the funnier stories I’ve heard during the writing of this series, and had me rolling when he told it to me. Jack is behind the scenes now and promoting the Southern Legacy Wrestling show out of Munford, Alabama these days. Located not far from Birmingham, they run show on the 1st and 3rd weekends of each month to average houses of around three hundred in attendance. He has been involved in the wrestling business since the heyday of the Eighties, and has turned in his tights for a job in the office, working to build and further herald the business he loves. I urge you to get out to one of their shows if you’re in that area and support the local product. Without these promotions there would be no young talent to send to the bigger stages of the worldwide touring giants. Very few wrestlers are gifted with “it”, or get the open door policy to the business that some children of wrestling families are privy to. The independent promotions are more important now, than since the days of the original territories for training and instilling the ideals of what it means to be a wrestler, and not just a highlight reel. For that I say thank you, to all the old school guys out there like Jack Lord, who keep the torch of our heritage alive. Until next time Bruthas and Sistas, keep the wheels turning and the freedom burning. Peace.